uuid : 4820fdd6-c048-48da-97ac-1ad76b22c73a templates_id: 119509 templates_uuid: "15e547fd-b1db-40e7-a65e-70033081bc8d" title: "Room rental agreement - Tenancy Agreement For Rooms in Shared House" display_name: "Room rental agreement" meta_keywords: "Agreement for renting a room" description: "
Rent out rooms in your house safely to tenants with this room rental agreement using this type of tenancy agreement for private landlords. Give yourself peace of mind when letting to a group of people who are not all members of the same family by creating separate agreements for each tenant. Try this assured shorthold tenancy to let out your whole house for a short period at a full market rent and be able to get it back, if you wish, after six months. This type of tenancy agreement also makes it simpler and quicker to evict tenants who fail to pay their rent or cause a nuisance. A room rental agreement is an agreement that allows a landlord to rent out rooms in a property they own but do not live in. Do I need a room rental agreement? You will need a room rental agreement if you own a property that you do not live in and want to rent it to a number of tenants at a market rent. How many tenants can live at the property? There can be no more than three tenants (who are unrelated) living at the property. If there is more than three the property may be classified as a House in Multiple Occupation (HMO) and additional regulations may apply. What areas of the property will the tenant use? The tenant has exclusive use of a bedroom at the property but also has the right to use other parts of the property that are shared with other tenants. These areas are known as the common areas and are usually the kitchen, living room and bathroom. The rent can be set at any level up to \302\243100,000 per year in England and \302\24325,000 in Wales. The rent will be the market rent similar to other lodgings in the area. It is usual to take one month\302\222s rent in advance at the start of the agreement. Can I take a deposit? The landlord can ask for a deposit to cover the cost of any breakages or damage to the property or its contents. If when the tenant leaves there is no damage or rent due, the money is returned. All deposits must be placed in a Government Authorised Tenancy Deposit Scheme within 30 days of receiving the deposit. Should I include an inventory? An inventory is a detailed list of all of the items in the property that the tenant can use. An inventory should always be made as it can be used to prevent disputes at a later time about the condition of items. 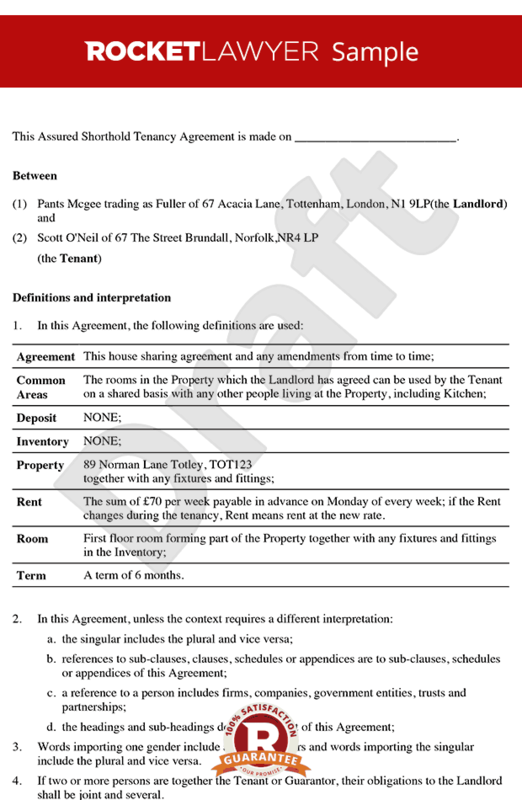 The tenant cannot end the agreement before the end of the term. Termination by the landlord depends on when the notice to terminate is given.
" created_timestamp: "2018-10-08 04:36:30.0" modified_timestamp: "2018-10-08 04:36:30.0" active: true created_by: 102 modified_by: 102 dcm_id: 204 url_slug: "Room-rental-agreement" meta_description: "Create a room rental agreement to rent out your house safely with step-by-step guidance from Rocket Lawyer. Give your house share security when letting to multiple tenants. Try this house share agreement for free." time_to_complete: "20 minutes" role1: "Landlord" role2: "Tenant(s)"
The rent can be set at any level up to £100,000 per year in England and £25,000 in Wales. The rent will be the market rent similar to other lodgings in the area. It is usual to take one months rent in advance at the start of the agreement. More than just a Room rental agreement template, our step-by-step interview and guidance makes it easy to create your document. Easily create online, download, print and sign your free Room rental agreement in minutes. This document is also sometimes called: Agreement for renting a room.